The image shown is excavated from Orai village situated in Jalaun district of Uttarpradesh State. The image is now preserved at Lucknow State Museum. After careful examination by Scholar M.N.P. Tiwari, he deduced that the sculpture is hailed from 11 century AD as the Jina image is completely developed from Iconographic point of view. The image is of First Jina savior Rishabhnatha as identified by Bull lanchana on pedestal and curly long hairs fallen on shoulders of Jina. Generally iconic representation of Jina Rishabhnatha had been developed over centuries by depiction of curly hairs till shoulders. The image is constructed from buff sandstone and depicted in fully developed iconographic style. The remarkable thing about this sculpture is delineation of two Yakshini viz, Ambika, and Lakshmi as subordinate and governing deities of Jina. The Jina is depicted in cross legged mediation posture with upturned palms placed one on other. 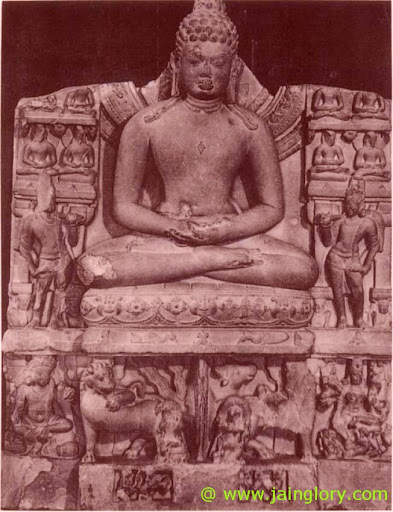 He is seated on lotus whose petals are spread over an ornate cushion. Iconographic details of this image is very beautiful and in well developed state. Shrivatsa mark is carved on chest of Jina Rishabhanatha. His long protuberance or Ushnisha is long enough to make it specific for Jina Rishabha. Ornate cushion is placed over Triratha pulled by two lions. The two lions are standing with paws are in upward position flanked on both side of Dharmachakra. Left extreme and right extreme positions are occupied by Yaksh and Yakshini on both side of Dharmachakra.